I've been seeing this around today, so I decided to copy it from Janet. Apparently you're supposed to give one-word answers, so I had to re-do mine. Your General Thoughts On the Presidential Race: Sigh. I've stolen this from Doola, who is getting married to MLE tomorrow. Congratulations to both of you! * Pick 15 of your favorite movies. * Fill in the film title once it’s been guessed. These are the rules, people! * Leave guesses in the comments. * No Googling or using IMDB search functions. Don’t cheat, suckas! * Know-it-alls, limit your guesses to three movies. Save some for others! I don't think I made it particularly easy, but have at it! I haven't had any time at home in the evenings this week, but I managed to get a total of three cupboards cleared out over the weekend. I picked the easy ones first, but it's been so satisfying that I need to share my minor amount of progress. Please don't laugh at my horrid '50s cabinetry! You'll notice that I threw away most of what was in there. Actually, the stale food went in the yard so the birds and squirrels could have it, and I moved the nutritional supplements elsewhere. 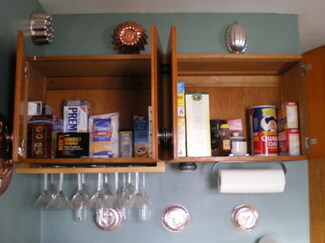 I should have plenty of time this weekend to work on the rest of the cabinets. My Flickr set of horrible "Before" shots is here. Here's the Kitchn Cure site again - today's the last day to sign up. Anyone else doing this and making progress? Attention Kansas City area folks! There's a KC Blogger Meetup tonight starting at around 5:00 p.m. at Jaywalkers Sports Bar and Grill, 3916 Rainbow Boulevard in KCK. Today's drink special is $2.50 local brews: Free State, Boulevard & Flying Monkey. They had me at Free State. If you've never been to one of these, they're a lot of fun. Come on out! Jenny on the Spot was kind enough to nominate me for the Excellent Blog Award. Actually, she did it more than a month ago, so I know I look like a lazy ingrate waiting this long to accept. I apologize for that. Identify the originator of this award, and link so she can get her well-deserved traffic. It's Kayla at Project Mommy. Great idea, Kayla! Pass on at least 10 Excellent Blog Awards. I don't know if I've mentioned my RSS feed totals lately, but I'm up to 639. That makes it quite a challenge to choose award winners, so I'm going to limit myself to people I've met in person. Even so, I'm sure to leave out a bunch of great blogs, so please don't be offended if you're not on the list. It's worth pointing out that with the exception of two people on the list, I met everyone else at one of the BlogHer Conferences. If you're trying to talk yourself into going, there's the best reason I can think of! I hate to admit it, but I'm starting to enjoy Twitter almost more than blogging. If it let you include photos, I'd be in heaven. I took Velcro to the vet. There's nothing they can do about her hearing, but she seems otherwise healthy. They did a needle aspiration biopsy of a lumpy area on her chest because of her history of cancer, but the doctor is inclined to think that it's nothing serious. My niece and I went to Disney on Ice Princess Wishes. When my sister brought her over, she didn't know where we were going. When I told her, her reaction was forced and polite, which made me realize that she really is a getting a little old for stuff like that. Oops. I took her out for dinner and then we went to the arena. Our seats were excellent and it ended up being more fun than either of us had expected. Leave it to Disney to understand how to put on a spectacle. My main source of entertainment was waiting to see if any of the ice skaters would fall down. Aladdin came close, as did Snow White and her prince, but we had to wait for the final number before Prince Charming bit it. On Sunday, I got up early to bake Italian bread and make the baked ziti for Easter supper. I'd accidentally bought fat-free mozzarella for the pasta, but fortunately I found a grocery store that was open. There ended up being eleven people at my sister's for the meal, so I was glad I'd chosen a dish that makes a ton of food. Even so, there were no leftovers. I don't know what I did to myself yesterday (carrying the giant sack of food? carrying a big bag of kitty litter? ), but my neck and back are aching and spasming fiercely today. There's no point in my wearing perfume today because you wouldn't be able to smell it in competition with the Flexall. Other than that, I'm feeling optimistic about the day. How about you? I'm up early today, so it seemed logical for me to get some things done around the house. 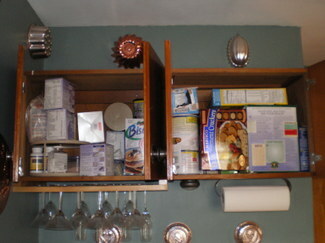 I started with the kitchen, which is a major target since I signed up for the Kitchn Cure yesterday. 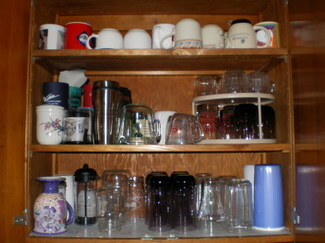 I don't live in an apartment, but my kitchen is cluttered and disorganized just the same. Now that it's light outside, I need to take all of my "before" pictures and post them on Flickr. 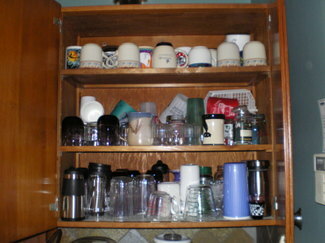 After that, my goal is to clean out one pair of cupboards. I think I can fit that in before I have to take Velcro to the vet at 10. I'm also working to get caught up on laundry. While I was folding clothes from the dryer a few minutes ago, it occurred to me that there are two really stupid things going on with my laundry system that could be easily remedied. First of all, I am still using a top-loading washing machine that deposits noticeable clumps of lint over all of my dark clothes. I've been trying to hold out until the machine dies, but that really makes no sense. It's time for an upgrade. I was planning on being home most of the day today, but I ended up scheduling a bunch of stuff after all. I'm going to volunteer with an animal rescue organization for a while this afternoon, and my Disney Princesses on Ice tickets got switched to tonight after they cancelled Sunday's 6 o'clock show. I guess I'll be making all of my Easter dishes tomorrow morning. Next on my agenda: sweeping up around the cat boxes in the basement. Don't you wish you were me? You do not experience strong, irresistible cravings and consequently do not find yourself tempted to overindulge, however you don't usually get angry too easily but some things can annoy you. You get overwhelmed by too much noise and commotion and do not like thrill-seeking activities. You tend not to express your emotions openly and are sometimes not even aware of your own feelings. You dislike confrontations and are perfectly willing to compromise or to deny your own needs in order to get along with others, however you feel superior to those around you and sometimes tend to be seen as arrogant by other people. You take your time when making decisions and will deliberate on all the possible consequences and alternatives. Take a Personality Test now. Hmm, not exactly on the mark, but it nailed a few things. I've been noticing that Velcro is sleeping really hard these days and doesn't even wake up when you come into the room or approach her. I'm starting to think she might be going deaf. 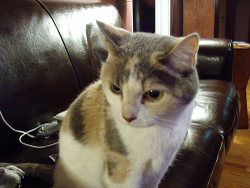 She's at least 15 years old (she was my late mother's cat, so we're a little fuzzy on when she was born), and she's already had one mastectomy for breast cancer. I hope she's not running out of steam. As her name suggests, Velcro cannot stand to spend a moment apart from her favorite humans. When I'm in the living room, she's sitting on my lap. When I'm in the bathroom, she's standing on the counter (except when she's drinking out of the toilet). The sad thing is that she's starting to get a little clumsy about jumping up on things, and sometimes she doesn't quite make it and falls. I've recently rescinded the "no cats in the bedroom at night" rule just because Velcro so enjoys sleeping on or next to me all night. I'll admit it, I love the purring. She's due for a checkup at the vet, so I'm making her an appointment for Saturday. I'm keeping my fingers crossed that she'll be around for at least a few more years. After waking myself up coughing yesterday, I went ahead and called my doctor and got an appointment over my lunch break. Turns out I have bronchitis now. I started a ten-day course of antibiotics yesterday and also bought a new bottle of Vick's Formula 44 cough medicine, which is the cheapest cough medicine on the shelf for some reason. The doctor had offered me some codeine cough syrup, but I have a hard enough time waking up in the morning as it is, so I declined. After work, I finally went to the chiropractor after weeks of delay. I told her that my left ankle had been bothering me for no reason I could fathom and she said she'd been seeing a lot of ankle and foot pain in people who'd had the flu. How weird is that? She worked the reflexology points in that foot in the most painful manner imaginable. I told her she was in danger of taking the title of "Most Excruciating Therapeutic Treatment" away from my deep-tissue massage therapist. Strangely enough, the other foot was fine, as was my neck and shoulder area, which is usually extremely tight and painful. I guess this flu really does do weird things to your body. Later on, I made it through last night's band practice with a dose of cough syrup, lots of water, and a slug of honey. I'm feeling optimistic that my singing voice will be more or less back to normal by our next practice. Words can't convey how tired I am of being sick. I really hope this last batch of medicine is going to do the trick.